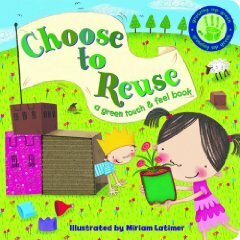 I recently found the book Choose to Reuse (a green touch & feel book) while looking for an environmentally sound gift for a two year old. What I like about this book: It’s produced sustainably. This fun story carries the message of reuse, which is the ultimate in recycling. In the story, a box becomes a princess castle and an old blue towel becomes a superhero cape. This delightful story entertains youngsters while giving them ideas for playtime and teaching a valuable lesson. Our house is over-run with books because I fully believe in the value of reading. I also believe that owning books (and reading them together) is vital to a child’s development. (Disclaimer- Yes we do borrow a lot of books. We also frequently purchase secondhand books). If you are looking for a way to shed a few books (to make room for more, of course) or you want to start a service project with your children, check out EnviroMom’s suggestion for reusing old books. If you own a few books which are beyond repair, here are some tips for reusing much of the book (remember to recycle whatever cannot be reused). Make a puzzle, memory game or mobile from the picture pages, board books are best. If you want to use paper pages, simply attached the page to a sheet of (recycled) cardstock or cardboard prior to cutting your shapes. One of our favorite uses for pretty picture pages (old calendars too!) is to mat and frame them. A ballet calendar become 12 wall photographs for my daughters’ ballet room. The pictures from several Mary Engelbreit calendars were used as wall paper in my former kitchen. We also like to make envelopes out of magazines or other paper pages. This is fun with word print or pictures. Picture search- cut out items, people or animals from pictures and collage everything onto a larger piece of cardstock. Then ask your children to find items (bear, cup, tree, rattle, truck, eyeglasses) or ask them to count how many of one item there is in the picture.